Granulomatous thyroiditis is a rather unusual problem of the thyroid gland. It can be difficult to diagnose as the patient displays symptoms of both too much and too little thyroid hormone. Fine needle aspiration neck is one of the fastest and most accurate ways to diagnose this disease. The thyroid gland plays an important role in the body’s metabolism. However, this small, butterfly-shaped gland in the neck is susceptible to problems such as lumps or nodules, the secretion of too little or too much thyroid hormone, cancer and other conditions like granulomatous thyroiditis, or De Quervain’s thyroiditis. The diagnosis of granulomatous thyroiditis can be difficult, as the disease is relatively rare and the symptoms mimic other thyroid conditions. Both men and women can be affected by granulomatous thyroiditis, and the disease can occur at any age. However, as with other thyroid conditions, middle-aged women are most likely to develop the disease. It is thought to result from an acute viral infection. In most cases, a period of excessive thyroid hormone secretion occurs first. Neck pain, fever, a rapid pulse, weight loss and other symptoms of hyperthyroidism occur. Painful swallowing is another common symptom. The cells in the thyroid gland are damaged and unable to take up iodine, which then results in hypothyroidism. Symptoms of the latter include dry skin, weight gain, fatigue, constipation and thinning hair. The fluctuating symptoms and rarity of granulomatous thyroiditis can delay diagnosis. Blood tests measure the levels of thyroid hormone, but don’t offer an explanation of the reason for the changes. A fine needle aspiration neck is often the best way to obtain a diagnosis as it can show the actual changes in the thyroid tissue that signal the disease. 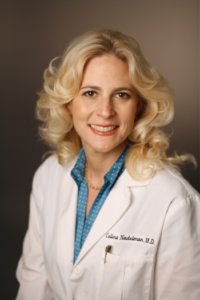 In the hands of a board certified cytopathologist such as Dr. Celina Nadelman, the fine needle aspiration provides a rapid and accurate diagnostic method. A fine needle aspiration is much what the term implies. A small, thin needle is inserted through the skin and into the thyroid gland. Suction is applied to obtain tissue and fluids that can be examined under the microscope. It is an office-based procedure and requires no more than a local anesthetic. In most cases, the diagnosis is available within 24 hours. The test is less expensive than most other options and there is no patient downtime. Since the disease is self-limiting, an accurate diagnosis means unnecessary treatment can be avoided.